Most people know they should visit the dentist every six months, but they fail to actually keep up with these routine visits. Your dentist in Temple says that’s too bad, because checkups and cleanings come with a number of benefits for oral and overall health. Keep reading for 7 reasons NOT to miss your 2 visits to the dentist this year! Gum disease is a chronic condition that affects the majority of patients over the age of 35. It is associated with red, bleeding, and inflamed gums — as well as a host of issues with systemic health. Patients with gum disease are more likely to have diabetes, heart disease, high blood pressure, and other health conditions. But this disease can be prevented with routine checkups and cleanings. And, if it’s caught early enough, gum disease can easily be reversed. One side effect of gum disease is tooth loss — but untreated tooth decay, a leaking restoration that goes unnoticed, and other factors can also contribute to the loss of pearly whites. And guess what? The best way to avoid these issues is through excellent hygiene and regular professional attention — best achieved through 6-month checkups and cleanings. A dental cleaning is your hygienist’s chance to remove plaque, tartar, and bacteria buildup from the surface of your teeth and around the gums. This is the stuff that causes your breath to smell less-than-fresh even soon after you brush. So, if you are frequently dealing with a foul odor coming from your mouth, a visit to the dentist may be just what you need. People who have attractive smiles are more likely to report having stronger self-confidence. What’s more, a study from Kelton Global found that people are perceive beautiful teeth as being more successful, trustworthy, and likeable. That’s quite a positive side effect of seeing your dentist regularly! 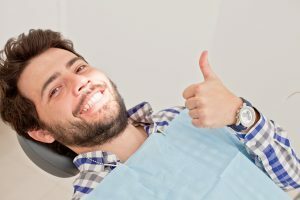 A strong, trusting relationship necessarily develops between patients who repeatedly see the same dentist every 6 months over the course of a lifetime. These relationships result in better care, as the team will really get to know you and your smile — and what makes it tick. Is your child reluctant to visit the dentist? Maybe it’s because they’ve seen you putting off your own preventive care. After all, it’s difficult to convince them that something is important that you yourself don’t practice! Staying on top of your checkups and cleanings may help to put your child on the path to a lifetime of happy, healthy smiles as well. And, last but not least, if you have dental insurance, your 6 month checkups and cleanings are covered anyway! You are paying for these appointments upfront in the form of your monthly premium, so it doesn’t make sense to skip out on them. So, there you have it — 7 reasons to schedule an appointment with your dentist this month! There’s a wealth of evidence to support why it matters, so don’t wait another day to recommit to your oral health. Fossum Dental Group offers full-service dental care from the comfort of their family dental practice. From the youngest in your family all the way to your own parents, Dr. Fossum and Dr. Elmore do it all. Don’t hesitate to get in touch with them by calling 832-595-2266 today!